If you’re a little kid, that announcement at the beginning will probably make you say, “Noooo!” or “Gee whiz!“. Me, the 1966 TV viewer at the ripe age of 37, would keep watching. You can’t go wrong with a comedy legend like Jack Benny. All of the sketches made me laugh. What’s interesting in this special is the Smothers Brothers. According to IMDB, their CBS variety show debuted on February 5, 1967. What I’m guessing is that someone saw them on this special, or something prior to that, and thought that they should have their own show. They were always hilarious. The most memorable bit here is by far the Tijuana Strings with Mel Blanc doing the famous “Sy Si Sue Sew” bit that dates back to Benny’s earlier days. A very hilarious hour indeed. In Knoxville, what happened to this special? If you’ll remember in this article, Star Trek was not seen on WATE. So, with this special airing in that slot, there was only one solution. Tape delay! It was tape delayed to the following Sunday, December 4th, at 4:00pm. 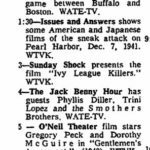 And it might not have even played at that time because right before it on NBC was an AFL football game between the Boston Patriots and Buffalo Bills. (Boston won 14-3, in case you’re curious.) If I had to guess that game probably didn’t run over it’s 3 hour time slot, given for the fact that there were a *lot* less commercials during sports broadcasts in 1966 than there are today. That’s another examination for another day, however. The real thing to point out, however, is that if you look at the grid of what was on other stations, you will notice that on WRCB (Chattanooga’s NBC station) and WCYB (Bristol’s NBC station), you will see Meet the Press. Wait, what? That means WATE was preempting one network program with a tape delay of another network program that was preempted by a locally ran program. That sounds totally bizarre, doesn’t it? 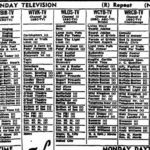 That’s why I like looking at old TV listings!